Word of warning from someone who has been playing with SN95's for 15 years, Dont change the upper rear control arms or even install poly bushings on them. Whether or not your Mustang is equipped with an MM Panhard Bar, it is very important to have rubber upper control arm bushings. This is one application where the compliance of a rubber bushing is a benefit. A four-link is over-constrained, a situation that requires the upper arms to physically change length as the suspension moves. Obviously, the metal control arm cannot change length. But its effective length, the distance between the control arm's two pivot points, can change because of the inherent compliance of a rubber bushing. If the ability of the upper control arms to change their effective length is hindered by a noncompliant bushing material, the suspension will bind up, and not move freely. The only way for the suspension to move is for the metal control arm mounting brackets to bend. The resulting restriction in the ability of the rear suspension to freely articulate will cause poor handling; the car will have a tendency to oversteer, and it may do so in a sudden and unpredictable manner. Retaining the rubber upper control arm bushings is a necessary compromise for acceptable handling. MM has stock replacement upper control arms and axle-end rubber bushings. I have personally seen broken parts and broken floorpans result from aftermarket upper control arms. 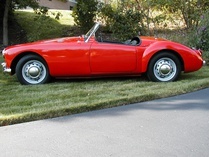 A number of us call the rear suspension "Quadrabind" for a reason. I bet that sound deadening makes driving/riding quite pleasant. I'm curious to see what seats you find. I could use a pair for mine. Well, I also need a back seat if you come across any functional ones in your junkyard hunting. I got the stock headers off and a set of Ford racing headers to go back on it. The car has an aftermarket catted h-pipe and a flowmaster cat back. You're welcome to my stockers if you want them. 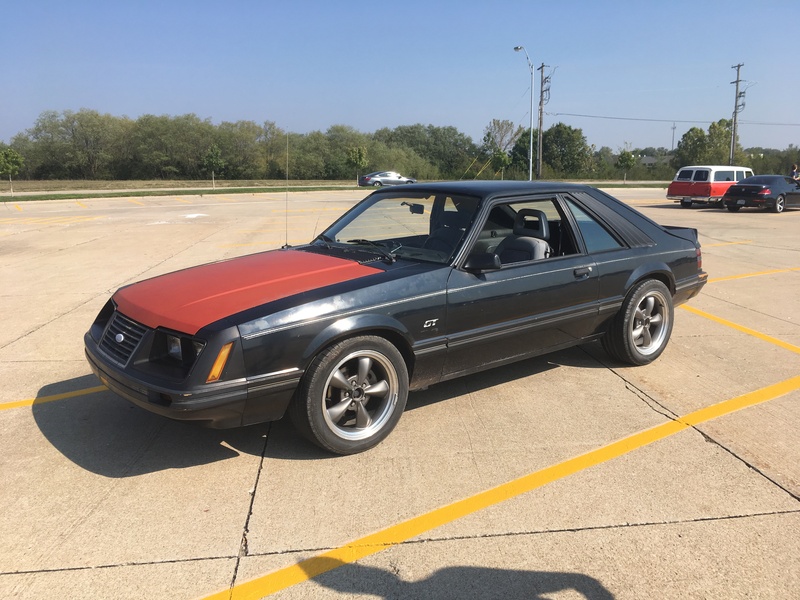 I sent you a PM with a link to a really "Rad" Mustang II I found on CL up here. And yeah...if we can get together in the same place at some point, I'd be happy to put those stock headers to use. Thanks! I checked out that link. Looks like a good buy, but between the fox and the gmt400, now's not a good time. Lol. Mainly because I'm out of room. I got a friend up in Columbia with some cool projects I want to check out. Might make it up there one weekend soon. Got the headers bolted to the heads. Tomorrow I'll get it bolted to the mid pipe. I did a smog pump delete. The holes in the back of the heads are going to be full of carbon. I'm just going to cut the pipe and cap it, same for the tube on the h-pipe. I haven't udpated this thing in forever. I have ordered a bunch of new parts from lmr and bought a bunch used here locally. I was cruising the local mustang Facebook page and found 94-95 front spindles and brakes set up for 75 bucks. I plan on upgrading the calipers to the pbr's from the 99-04 cars. Found a sn95 8.8 rearend with 3.73 gears for $200 bucks on the same page. Also found a set of upr non adjustable lower control arms, and a set of upr adjustables uppers on the same page for 125. They were brand new. On the same page I also found a set of Sr lowering springs for 60 bucks. I traded my stock rearend for a set of gt40p heads and a Mac prochamber h-pipe. I ordered a new carpet from lmr. Got the light gray, kind of wish I got the dark gray, but whatever. Lol I used a 10 off coupon and got it for roughly 120. For now I picked up a set of perfect 04 v6 power front seats. I originally got them so I could at least drive the car for now, and replace them with something nicef later.... But they match the interior really good so I might just keep them. Got them for like 55 bucks from one of the self service yards. Got the tracks and all. I posted a WTB ad for a console delete panel. Guy said he had one and it was cheap so I drove and hour each way to pick it up. Turns out it was an arm rest delete panel for a 87-93 car... But he had a new drive shaft loop I bought for 20 bucks. Luckily I drove the focus up there and it gets 34 mpg, so it only cost me about 10 bucks in gas... Always ask for pics. Lmr had the koni orange struts and shocks on sale, added a $25 off coupon and got them for like $320 bucks. Today I jumped jumped on lmr and ordered some parts. Svt caster camber plates and sve full length subframe connects. I had a 25 off 250 or more coupod code. These parts were 249.99. went on the hunt for something cheap that I needed so I could get over the 250 mark. Did a search, cheapest thing they had was a 4.99 decal. Ehh, found door panel clips for 8 bucks, that got me to 258ish, or 233 after my coupon. I jumped back on lmr and used an the 7% off coupon and ordered torque box reinforcement for the uppers and lowers. 83 bucks with coupon. Next I'm going to order new front control arm bushing.. new sway bar bushings/end links... And sn95 ball joints. Oh, and new stupid spring isolators. That will totally renew the supension and most of the brakes. After I get the suspension done, I'm moving to the interior, going to get it all finished. Then I'll start on the engine build. Still deciding between a t5 swap or a 4r70w with a stall and manual vb. Ordered some more parts, that's 3 lmr orders today. New/gently used springs, sn95 spindles/brakes and the driveshaft loop. Stopped by harbor frieght. The impact was doa. I had one I bought last year and it was awesome. Loaned it out and never seen it again. Upr non adjustable lowers, upr adjustable uppers, a 4.5" grinder (couldn't find my other grinder) and somewhat crappy flix core welder I got on sale for 88 bucks. Picked these set of cobra rims for $200. Somebody painted them and did a crappy job, but they are in decent shape and have good tires. I'll blast them and repaint them. Probably try and trade them for some nice bullitt wheels eventually. Ive been using that flux core for years. Put good wire and tip, clean and tighten the ground, and run with it. Mines still going strong after 50-60 lbs of wire. Nice pickups. The SN95 rear is wider, but the mounting points should be the same. Also, brake lines different, as well as e=brake. When I bought the sn95 rearend the guy was like here, you can have these too... A new set of race craft brackets that allow you to put sn95 disc on the rear of a fox (retaining the fox length axles.) The brackets costbalmost what I paid for the rearend. Nice score. On the last Fox, we went with a totally beefed 8.8, with disc conversion. Cool! You're two right side (I think it's right side) Ranger axles away from a fox-width 8.8 with good gears, good brakes, and a limited slip! I'm just going to use the sn95 length rearend. That is working well for me. I can get some photos if it's helpful. Yes please? What all did you have to do with the brake lines front and back and what master cylinder did you run? Please, the world needs less bullit wheels not more. I love them but when everyone has them on their car - overdone. For the front brake lines I used the Maximum Motorsports braided stainless ones that are specifically built for running SN95 brakes on a fox body. In the rear, for the body-to-axle flex hose I just used a stock replacement rubber hose. I think it was probably for an '87-'93 application. I'll try to confirm that. The caliper hoses are just stock rubber ones as well...the ones that were on the rearend when I bought it. Damn looks good, on my 1989 that has been four eye nose swapped. 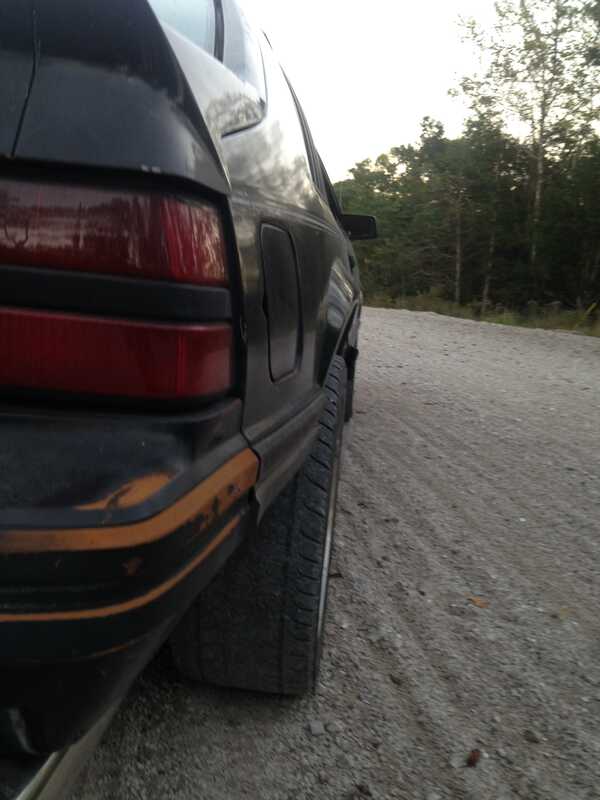 I swapped to SN95 axle shafts into my Fox housing and with 275/45R17 on 17x9 + 35mm offset Im right flush with the rear fender lip, maybe a slight poke out. 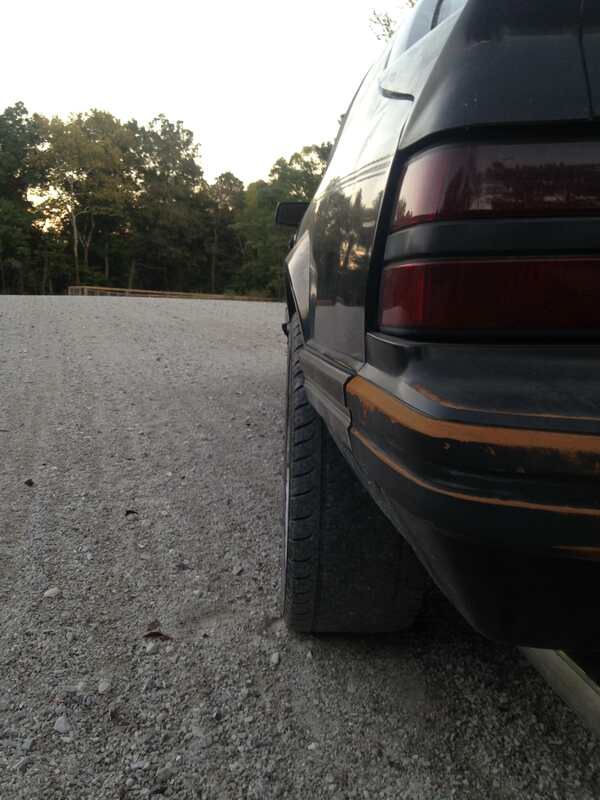 Its quite awesome how well your tires are in those fenders. Pulled the upper and lower control arms from the body. Installed the upper and lower torque box reinforcements and then tacked them in with my ultra sweet harbor freight welder. I can say I bought some Lincoln wire for it and it is indeed much better than the stuff that came with the welder. Was going to put the rearend in, but I still need to wire wheel it and give it a coat of paint... Plus i want to paint the floor pan above where the rearend sits while there's a lot of room. Also going to paint the wheel wells all the way around. Basically any time I'm in an area removing parts, I'm going to scrub and paint that area. Eventually the whole underside will get painted that way as nothing is going untouched. This car was suppose to be a quick project... So much for that. Hoping to get the affected areas painted through out this coming up week, then next weekend finish up the suspension. Goal is to have it all licensed and driving by the end of April. I'll post progress pics this afternoon.